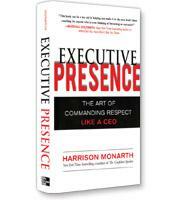 Success depends in large part on how to “break through” to the right people, writes leadership coach Harrison Monarth in his new book, Breakthrough Communication. To break through, you need to communicate effectively so that you can be noticed and supported by the people whose attention you seek. The goal is that they will listen to you and take action based on what you communicate. The process of breaking through can be as short as an instant — asking a colleague for help on a project, for instance — or as long as months or years. Successfully implementing new policy can be a long and arduous process of persistent communication. However, no matter what timeframe might be involved, breakthrough communication still rests on four steps, according to Monarth. The first of these steps, Monarth writes, is to get on the radar. Before anyone will listen to you, they must notice you. Being noticed (in a positive light, of course) begins by making the right impression when you have the opportunity to be before influential people. Monarth offers a variety of suggestions for making an impression, from looking your best to cultivating a reputation for expertise. 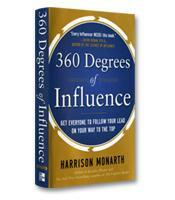 Monarth also emphasizes the importance of managing your status — that is, how do the people you want to influence see you? 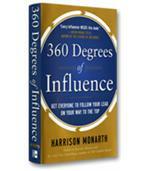 Monarth suggests creating a chart or list, starting with the people who will have the most impact on your success at the top. Impact includes interest; in other words, if you work for a Fortune 500 company, it’s possible that the CEO or the Chairman of the Board will never know your name. Although they are powerful, they are not a high priority in terms of your success. Once you have a prioritized list of people, you must carefully manage your status with them, ensuring a continuing dialogue so that they have the right impression of you. The second step in breakthrough communication is what the author calls “salience-agenda.” This means that you are the one who knows what is salient — what is most important to discuss and consider. You are, in essence, setting the agenda. One way to set the agenda, writes the author, is to take advantage of “focusing events.” Focusing events are major, usually unexpected events that grab the attention of most people — a hurricane or an oil spill, for example. These events are opportunities to focus attention on the agenda that matters to you; thus pollution control activists would leverage an oil spill to bring attention to the policies they advocate. There are, of course, much less dramatic opportunities to set the agenda. Imagine that corporate leaders want to reorganize the departments in your unit; now is the opportunity to advocate the creation of that specific department you’ve been thinking about. 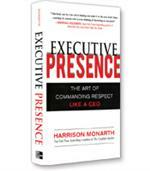 Even running into the CEO in an elevator, Monarth writes, can be an opportunity to set the agenda. Setting the agenda is not enough to ensure success in your communication. Equally important is the next of Monarth’s four steps: creating meaning. The goal in this step, in short, is to put your spin on the agenda item. The Newtown tragedy was a focusing event for gun legislation, yet both sides of the issue drew different meaning from the massacre. While gun control lobbyists argued for stronger legislation, the NRA and others — including a mother of six who, Monarth notes, wrote that gun control was “sexist and antifeminist” because guns empowered women — infused the shooting with a different meaning. One of the most powerful tools to create the meaning you want to create, according to Monarth, is storytelling. Monarth’s final step is to “spark the action you want to see.” Having people take the action you want them to take is, after all, the ultimate goal of communication. 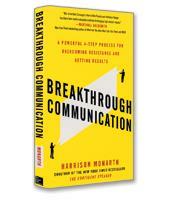 Monarth emphasizes that breakthrough communication requires persuading people, which is emotional and practical — not convincing people, which is rational and abstract. Fear and ambivalence are two major barriers to persuasion, although there are many other barriers, including failing to understand the audience, failing to engage the audience, or simply not being likeable. Through nudging and other techniques, Monarth shows how to overcome resistance and spark people to action in the final section of this practical and engaging manual on communication.